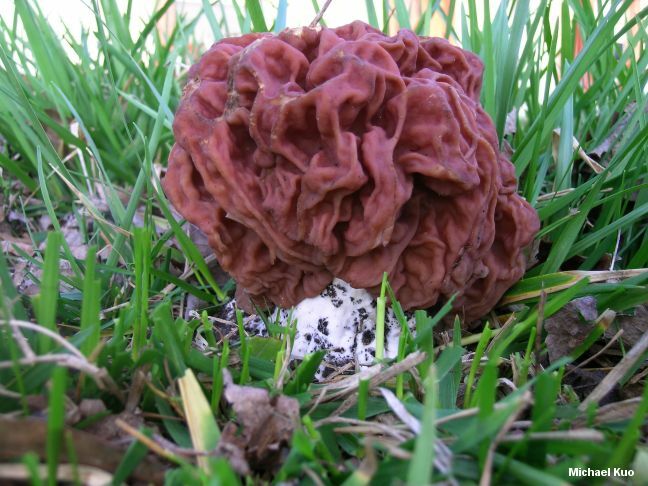 This springtime false morel is common in the south and in the Mississippi and Ohio valleys. 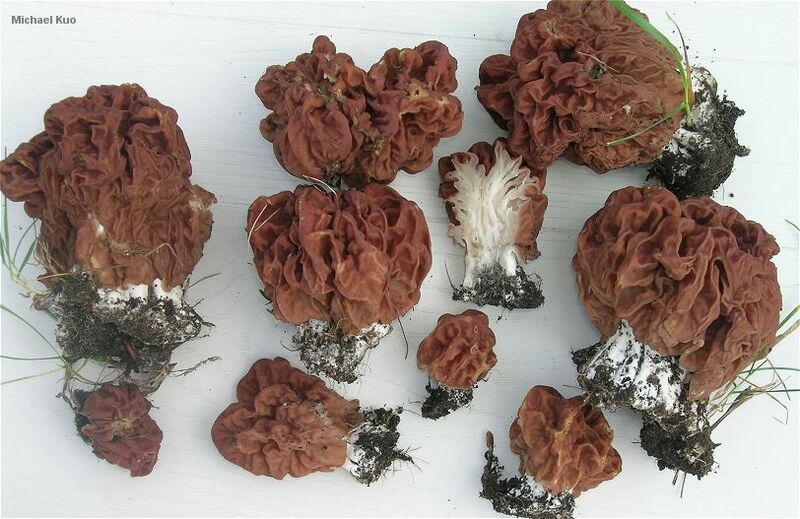 It can be distinguished from other species of Gyromitra by its geographic range, its large, white stem, its heavily stuffed and chambered interior, and its cap, which is reddish brown and rather tightly stuck to the stem. The cap surface is tightly wrinkled, and the cap shape is never lobed. 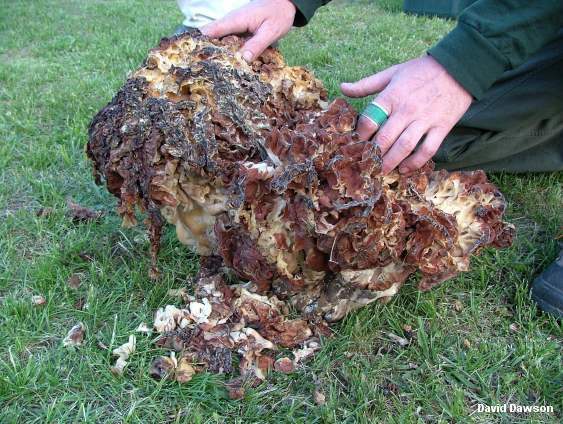 When sliced open, Gyromitra caroliniana specimens often feature chambered flesh near the cap surface that is reminiscent of broccoli or cauliflower. Massive specimens of this species are encountered with some regularity; see the photos to the right. 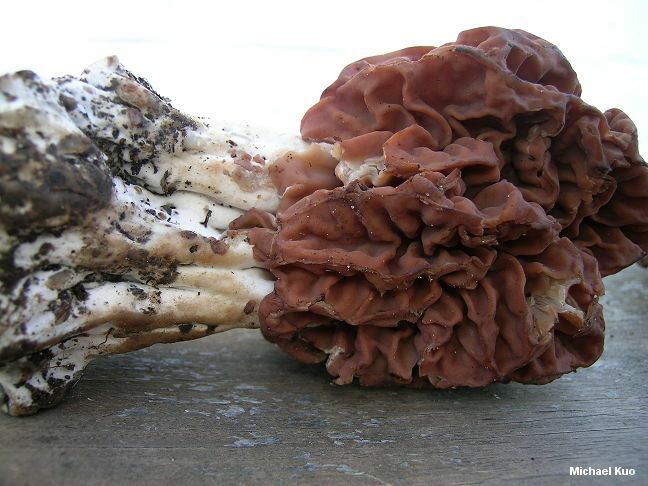 I have seen newspaper reports of "monster morels" weighing up to seven pounds; reports such as these are invariably reports of Gyromitra caroliniana, rather than true morels. Thanks to the Herbarium of the University of Michigan for facilitating study of the collection cited below. Ecology: Officially saprobic, but potentially also mycorrhizal--or, like the true morels, donning both ecological hats in the course of its life cycle; found under hardwoods--usually near rotting stumps and downed trees; spring; widely distributed in eastern North America from Kansas to the East Coast, but especially common in the south and in the Mississippi and Ohio watersheds (the northern edge of its range appears to be the southern Great Lakes). Cap: 5-11 cm high; 6-12 cm wide; variable in shape but usually more or less round; not lobed; tightly affixed; tightly wrinkled; bald; reddish brown; undersurface not exposed, whitish to grayish, bald or finely dusted, ingrown with stem. Flesh: Whitish to grayish; brittle; chambered. Stem: 4-10 cm long; 2-10 cm wide; white; becoming ribbed with vertical ribs up to 1 cm across; bald or very finely dusted; sometimes discoloring grayish on handling. 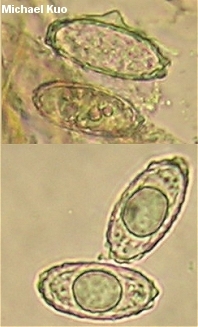 Microscopic Features: Spores 22-35 x 10-16 µ; with 1 large oil droplet and 2-3 smaller ones; ellipsoid; smooth at first, and often remaining so well into maturity--or, in maturity, developing ornamentation as ridges and projections that can extend 1-2 µ from the surface of the spore, or 2-5 µ at the ends of the spore, where projections appear as 1-5 apiculi; the ornamentation eventually sheathing the spore completely. Asci 8-spored. Paraphyses clavate to subcapitate; 5-7 µ wide; septate several times; orangish to reddish. REFERENCES: (Bosc, 1811) Fries, 1872. (McKnight, 1973; Smith, Smith & Weber, 1981; Smith & Weber, 1985; Metlzer & Metzler, 1992; Horn, Kay & Abel, 1993; Weber 1995; Abbott & Currah, 1997; Kuo, 2005; Miller & Miller, 2006.) Herb MICH: NSW 6105. Herb. Kuo 03260501, 04100601, 03191201. A Missouri specimen weighing 23 pounds!